"You can judge the state of a woman's mind by the state of her closet." It always elicited a collective groan from the audience, mostly because it conjured up the state of their closets, and I've rarely met a woman who felt good about that particular area of her life. The thing is, it's not only true for your closet, but for any environment in which you live or work. I’m certain that all of you have experienced the overwhelm of too much to do and not enough hours in the day, or a completely cluttered desk and not being able to find your host’s information. No one really likes working in chaos, and even if you claim you don’t mind, the distractions it causes can completely derail any significant success or momentum. If you have a workspace and systems that work for you and you do things the same way every time, you’re going to be able to relax into the knowledge that everything is covered and scheduled and that nothing is slipping through the cracks. That's why I recommend that you use the fresh start that the beginning of the year affords and do some serious cleaning in your office. Here's why: No matter where you sit down to work every day, that space has to feel positive and productive for you. A few years ago, I learned a concept that completely changed my life. Everything in your physical space is energy. Take a moment and just let that sink in for a moment. Everything, from your computer to a pencil, has energy. And that item is either contributing positively to you energetically, or it’s stealing your energy. Your office, particularly your desk and immediate work space, are prime real estate. They’re like beach front property in Malibu or Maui. Almost priceless. Begin to think of them in that way and don’t allow anything that’s not perfectly supporting you into that real estate. Take a look around your office right now if you happen to be sitting in it, and notice how many items in your immediate space are stealing your energy and how many are contributing positively to it. And then get rid of those things that aren’t supporting you. There are lots of great resources on office organization, but I will tell you that this one concept is really all you need. For the first time ever, I'll be offering two live webinars, one during the day and one in the evening, to accommodate as many schedules as possible. If you have piles and piles of paperwork, this same exercise applies. For these, an easier question might be “do I use this on a regular basis or will I need to access it again?” If you know you want to save it but don’t need to access it regularly, file it out of sight and possibly even off site in a storage area of your home. If you don’t need it, throw it away. Bottom line, get it out of the prime real estate. Here's the most important part about this exercise. 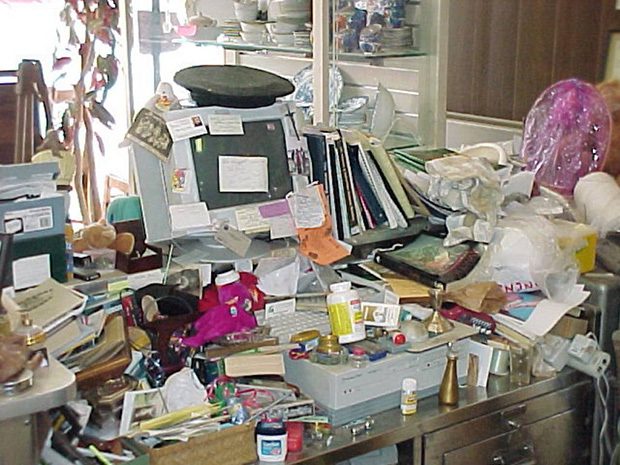 When you clear the clutter out of your physical space, you create room. For great ideas, the flow of creativity, and new opportunities. I've seen it happen again and again with my clients. Once you get your space cleared up, your thoughts clear up and you start to succeed at a different level.